Tinderbox User-to-User Forum (for formal tech support please email: info@eastgate.com) - Will Email to Tinderbox return? Tinderbox User-to-User Forum (for formal tech support please email: info@eastgate.com) › Tinderbox Users › Moving to Tinderbox 6 › Will Email to Tinderbox return? Will Email to Tinderbox return? Simplenote Premium is no more – for the moment it is no longer possible to sign up for a premium account. So, will Email to Tinderbox return soon? It would be much appreciated! Re: Will Email to Tinderbox return? It's certainly possible, though it was very costly to support and my impression was that it was thinly used. I can imagine that supporting an email function would be complex and thus would drop down the triage list. anything else that brings TB nearer one of its functions as a universal inbox or collector of thoughts, data, research, etc that you come across when it's not running or when you are not at a computer. For now, my workaround is to catch stuff on the fly in Evernote, and later transfer it as appropriate to TB. I personally would welcome some clip to / mail to / otherwise capture function for TB itself. A `Clip Selection to Tinderbox' service was available -- created by Mark Anderson? It worked in TB 5, haven't tried it with v6 yet. I just today extended my SimpleNote premium account until mid 2016, FYI. 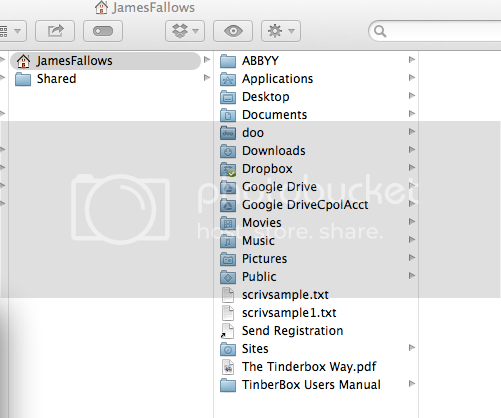 This by the way includes Dropbox sync. Watching from a distance the effort that Eastgate put into v6, I would not want them to elevate the mail capability from far down the list. I do agree that some integration with external services would be handy, but I think everyone will have a different list of what and how. The complexity may be mitigated by beefing up the autofetch capability. Any service should be able to publish to the web and be read from there. This would include TBx being able to strip out images and to reduce the html to TBx styles. I suppose this is hard too, but is more likely to be universal. Hm, the process calls TB to the front (I has a doc open already) but nothing is pasted in. I'll need to go look … looks like TB6 doesn't accept AppleScript commands. So for now, my old clipping 'service' does work. Sorry! One possibility that works is using the `Clip to Scrivener' service and then opening the resulting file in TBx (TBx 6 can now open Scrivener files!). Still, any of these routes (Scrivener/Evernote/...) feels like a kludge. Your comment "So for now, my old clipping 'service' does work. Sorry!" has confused me (not difficult I know!). So is it possible to clip from say mail into Tinderbox 6 ? If it involves the code you posted how should it be used? Also is it correct that Tinderbox 6 does not respond to any Applescript ? (I am unable to load a dictionary)? The service of that name on my Mac seems to work (under OS 10.8.5 at least) and the date stamp of the linked file post-dates my last post in this thread. Mark A, thanks so much for all the steps in explaining this. I have run into an odd obstacle that I hope has an easy / "D'oh! "-type explanation. I cannot find a Services folder in the place suggested in your how-to sheet. 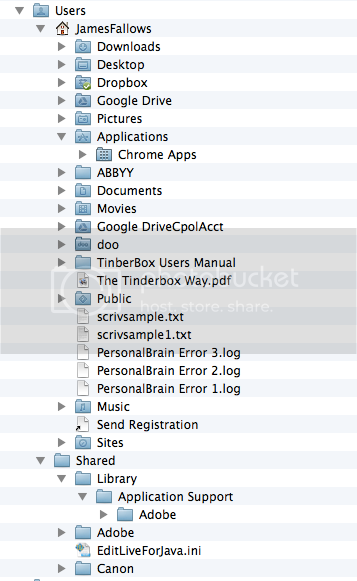 Unpack the zip file and locate the file called 'Clip Selection to Tinderbox.service'. If the 'Services' folder doesn't exist in your Library, add one. Here is what the relevant part of my disk structure looks like. [Correction: for the moment I can't get a screenshot photo to post. What it shows is no Services folder in the places one would expect.] When I try to create a new Services folder in this hierarchy, it tells me that's forbidden, because that name is taken. So obviously there *is* a services folder somewhere, (a) because the system tells me the name is chosen, and (b) because some services (for DevonThink, Scrivener, LastPass, etc) do come up properly now. How can I force the Scripts folder to reveal itself, so I can copy your utility into it? I am sure the answer is obvious, but it's not yet obvious to me. I have it working - thank you. 1) In Finder, press and hold the OPTION key. 2) From the GO menu, select LIBRARY. (The Library folder is normally hidden). 3) Scroll down to the Services folder. Ahah! Thanks for the tip! This sort of OS obfuscation can also be overcome by dragging the Library folder (once exposed in Finder) into the finder left sidebar where is becomes a shortcut as for Pictures, documents, etc. I guess it depends how often you use you Library. Since you two Marks were so quick and helpful in clearing up this OS basic-knowledge issue for me, I'll try you on the next one too! To get the Email-to-Tbox facility to work, I've tried to go to System Preferences/ Keyboard / Shortcuts, to place a check mark next to "Clip to Tinderbox." This linked video shows what happens next. In essence (a) there are two listings for this feature, and (b) neither of them will accept a click for more than a nanosecond. Each time I click in the box, the click auto-erases almost instantly. Does this ring any bell? Thanks again for guidance.